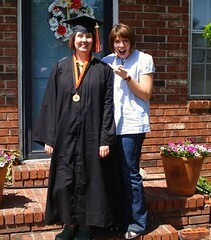 Saturday, my sister Janell graduated from Oklahoma State University with her degree in History. This was a very big deal and here comes the part where Janell's going to go "Ack! Don't tell the internets that!". Janell was the floater in the family. She married her first husband pretty much right after graduating high school. She worked at a bunch different places, had a baby, got divorced, and got remarried. She put off college. In the mean time she took a basic car mechanics class and learned how to fix her car. She made jewelry and other crafts. She cultured her inherited green thumb and grew a ginormous aloe vera plant and she nurtured various number of ducks and geese in her backyard. Then Janell decided to go to college. I think we were all a little skeptical at first, but she stuck with it. She worked hard to earn her diploma. Sometimes she worked part time to earn some extra money. She juggled classes and work to be home at the end of the day to pick Amanda up from school. She did not have it easy, but she did it. We couldn't be more proud of her. We all went to graduation and then Mom put together a party at their place afterward. It turned out to be a really nice day. And I can't say it enough. Janell, we are so proud of you!